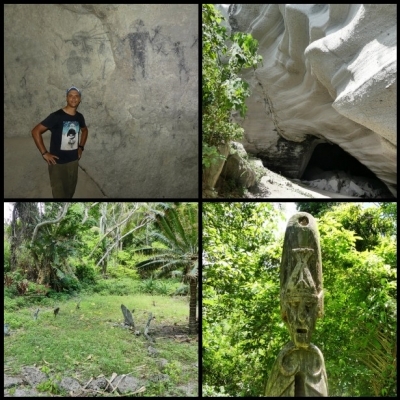 Chief Roi Mata's Domain is a group of archeological sites associated with the oral traditions surrounding the late chief. It consists of three early 17th century sites on the islands of Efate, Lelepa and Artok associated with the life and death of the last paramount chief, or Roi Mata. The property includes Roi Mata's residence, the site of his death and Roi Mata's mass burial site. Roi Mata is undoubtedly the biggest chief in Vanuatu's history. The "domain" inscribed is a triangle including his old tribe village, his burial grounds, as well as the cave where he supposedly died. Before you take the tour, and a tour is required, you should head to Vanuatu's national museum to not only learn about the chief and the domain, still listed as "attempting to inscribe" in the panels, other Vanuatu history, but also about Vanuatu's intangible heritage of sand drawing (better to wait for a tour of this to start but I think they only do this if enough people or if you come with a tour guide). I was leaving in the afternoon and the typhoon was coming in anyway so I asked the tourist information to book a shorter tour without the village lunch. I don't know what they show you around the village but from having to drive there to get on the small boat I don't think there is much to see and a lunch just for myself would have been overkill. In the end I think this was a great choice. Taking off to the appropriately hat island, the guide will tell you about the history of the place. They maintain the burial grounds here although it is only a small square. Unfortunately there was still plenty of trash washed ashore. Next stop is the fels/feles/fele's cave on Lelepa Island. The entrance is rather interesting to see the eroded walls. Inside you can see some cave art and the guide tells you about it. Interesting to see some of them but nothing too unique. The cave is small and was never used to live inside because as can be seen from a recent cave-in is would be too dangerous. I spent the rest of the morning snorkeling at the shore. One can see that this was not recommend to be inscribed due to the lack of management. The tour I booked was directly through the village but others, including the very expensive one from the tour agency I shall not name, is not actually giving any benefit to the village or at least not very much. The only thing stopping them is a sign to say that one should enter with a guide but then again they should have been specific because I'm sure the person taking you from another tour agency is also a guide. What I found best about booking directly is that they are flexible with the tour timing, customization, and didn't overcharge me for a single person tour. In terms of being culturally important I think that might only be true for Vanuatu or Melanesian people. I also don't believe that the three sites on the list have any way of showing you that importance, nor does it really link to the chief outside of legend and a grave (which we assume is his). I also find this sets a precedence to other countries wanting to inscribe their leaders, heroes etc, based on their burial, site of death and place of living. North Korea would be an example in where the tours always like to show off Kim Il-sung's farm huts (replicas? ), and even they haven't considered that as WORLD heritage, or the log cabin of Abraham Lincoln, both national historic sites. Would I recommend the tour/visit? Is it worthy to be a WHS? Would I visit again? Yes, worth to go if you are on Vanuatu especially if you need a dry day before flying out, but it can be arranged in half a day as I did and even if you are not into world heritage sites or the cultural aspect the trip is neat. No, I don't think this should be a WHS, sorry. 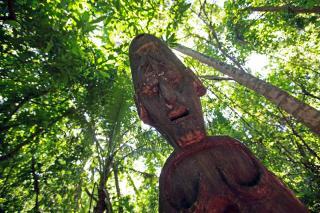 No, I would not visit it again; Vanuatu has more to offer than that. I visited this WHS in December 2017. 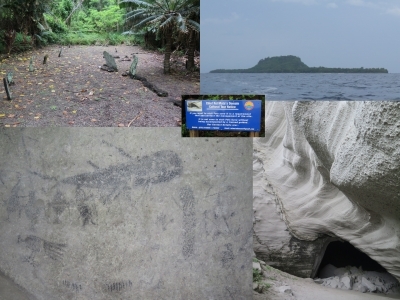 As can be seen my the UNESCO map of the inscribed property, this WHS is actually made up of 3 main locations: Fels Cave on Lelepa Island, Roi Mata's graveyard on Artok (Hat) Island and Roi Mata's Domain, Mangaas, on Efate. Since I wanted to make sure I could visit the paintings inside Fels Cave and cover all locations easily, I organised a WHS day trip with Atmosphere Tours. After picking me up at my hotel, we headed towards the rather rudimental museum in Port Vila. The most interesting section apart from the masks and chief roi mata sections, was the sand drawing UNESCO intangible world heritage with a live drawing. Next we headed to Mangaas near Mangaliliu down a steep unpaved road to Roi Mata's domain. From there we crossed over to Roi Mata's graveyard on Artok (Hat) Island with a local guide where we actually walked to the few burial stones and shells. After that, we went to Lelepa Island. After a number of steep stairs, we reached Fels Cave which is only open if you book in advance. The cave is literally disintegrating and eroding at a quick pace. We could actually see constant dust falling from the cave's entrance which already suffered a major collapse during one of the last earthquakes. The rock paintings are immediately visible just after the pile of rocks from the recent collapse. Make sure to bring your own torch with you as everything is pretty rudimental in Vanuatu so don't rely on the local guide's torch if you want to see the paintings in detail. Being quite unsafe, your time inside the cave is really limited and you enter at your own risk but I spent around 20 minutes alone in the cave (apart from the bats) which was quite an experience. All in all, the only really tangible heritage from chief roi mata's domain is Fels Cave, however if nothing is done to support the ceiling, I'm afraid this WHS will soon be lost. The locals do their utmost to welcome you and they really appreciate foreigners’ interest in their cultural heritage. I arranged a half day trip fro Port Vila through Island Holiday Tours to Chief Roimata's Domain at short notice. For 10,000 vatu I was taken by private bus to Mangaliliu village and from there along a rough track to Roimata's former village of Mangaas. Here I met my guide, who showed me some sacred stones and drums dating back to Roimata's time. From Mangaas I was taken by boat to Lelepa Island and made the steep climb up to the entrance of Fels Cave. There was evidence of fairly recent rock falls but the guide and I entered and with the aid of a torch he showed me a number of ancient rock drawings of fauna, flora and village scenes. Roimata's grave area on Artok (Hat) Island is tapu and only accessible by local villagers on special occasions. We landed on Efate Island in August 2010, the 14th. Just four days after a 7.3 magnitude earthquake which epicentre was only 35km from Port-Vila. We didn’t know about it, the earthquake was very impressive to local people because of its proximity but nothing seemed to be destroyed. -Introduction to the Chief Roi Mata story at the museum in Port-Vila. -Visit of the domain where Roi Mata lived, a dance show is performed by local people. -Entrance in the cave where he died (if you are luckier than us). 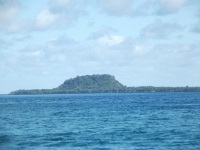 -Boat trip to Hat Island where he was buried with hundred of its followers. -Lunch in a village with local people. I won’t tell the story of Chief Roi Mata here cause you can find it easily on the net, but I can tell you that this WHS was very pleasant to visit as it is one of the very few cultural Unesco site in this part of the world. Everything looked well preserved, the guided tour was quite rustic with a very little boat but this is part of the Melanesian folklore. To conclude visiting Chief Roi Mata’s domain is probably one of the best way within Efate Island to learn about Vanuatu history. As you will automatically land in Port-Vila if you go to Vanuatu, don’t miss the visit of this WHS which starts in the town. You can easily find phone number in a guide book, or ask for information in the town center. Tour is probably not offered every day. Cave dwellings: Lelepa Cave was the residence of the chiefs according to local tradition. Assassinations: Roy Mata was poisened by his brother. Named after individual people: Vanuatu's last paramount chief, Roi Mata. In private ownership: The land on which Chief Roi Mata's Domain, Vanuatu is situated is privately owned by two families or the villages on Lelepa Island and Mangaliliu.